The progress of technology is changing every aspect of our life, from the way we communicate with each other, the way we live and even the way our brains work. In the field of education, technology has also completely reconstructed how we carry out teaching and learning. Because the improvement of technology, people have more options to choose the location, the time and methods to learn at their own convenience. It is important for educational professionals especially teachers to understand and adapt to the new wave of learning. Because the arrival of smart mobile devices, learning no longer restricts to the classrooms. People carry the entire Internet in their pocket and access on-demand information 24 hours a day. Tablets (iPads) are getting popularity in schools and more and more students take notes, complete homework and have tests with their tablets. The availability of free Massive Open Online Courses (MOOCs) from the best Universities further opens up enormous new opportunities for learners from all over world. The era of student-centred education is coming because of technology. Students are no longer waiting to be spoon-fed the content by the teachers. They expect to be able to participate or gain control of their own learning. 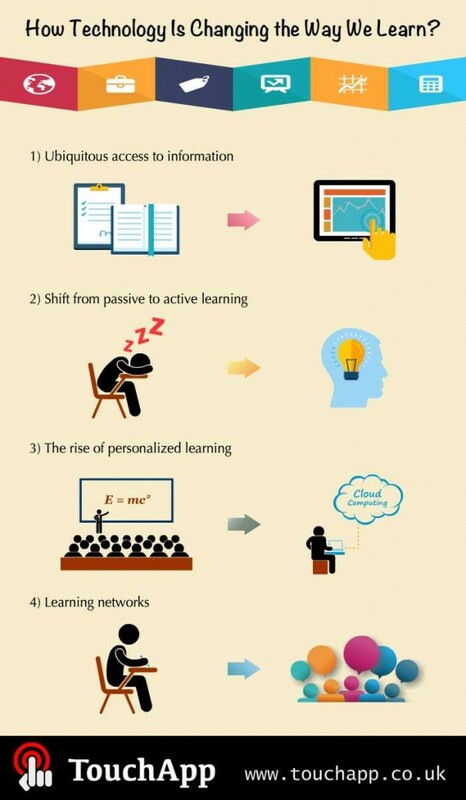 Technologies facilitate the active learning shift. Leaners use the Internet to acquire knowledge and solve problems. Web services like Google and Facebook become everyday learning tools. Smart devices and educational mobile apps offer active learners the possibility to learn whenever and wherever they can. Technology also enables personalized learning experience. People learn in different ways, at different paces and styles and it’s necessary to apply different types of instruction to different learners. Technology can help educators to collect instant learning data and perform data analytics to cater to the needs of individual student. Learners can get tailored instruction based on individuals’ learning profile and readiness level. With the introduction of new technologies, more people build up their own virtual learning networks as a primary source of learning. Through online networks, people connect with each other upon common interests and subsequently develop knowledge through these connections. A plethora of tools, such as Google Drive and Dropbox, enable global collaborative learning activities.